Sheep are seasonal breeders and the occurrence of estrus can be controlled by altering the photoperiod, stimulation by presence of a ram, and by various hormones. Ewes in seasonal anestrus may come to estrus in response to extended day length (~16 h) by supplementing light for 30 or more days followed by 60 days or more of 16 h of darkness per day to mimic the seasonal changes normally entraining cyclicity (see  in Fig. 2). This treatment is more effective when females are exposed to progestin treatments or teasers (intact males or androgen-treated, castrated males or females) near the end of the program. Exposure to novel teasers generally results in LH production and ovulation without estrus within a few days followed by normal estrus and ovulation in 18 to 24 days. Success is greater in breeds that are less seasonal in their breeding patterns. In fact, stimulation of less seasonal breeds with ram or teaser exposure without photoperiod manipulation may be highly effective. Technology for shortening the porcine cycle has not been developed because the CL of pigs are not responsive to known luteolytic agents until at least day 12 of the cycle. 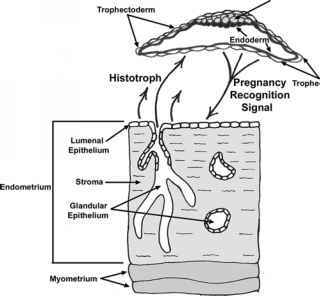 Another approach is to interrupt estrous cycles by first establishing pregnancy or pseudopregnancy. The latter is accomplished by administering an estrogen on days 11 to 15 to mimic the pregnancy recognition signal. In early pregnancy (or pseudopregnancy), the CL become responsive to PGF2a and luteolysis can be induced with exogenous PGF2a (see  in Fig. 1). A single dose of PGF2a may be given, or two doses eight to 12 h apart may be more effective. This approach can be combined with gonadotropic hormones to increase ovulation rate and/or control the time of ovulation (see  in Fig. 1). For example, pregnant females may be given PGF2a to regress the CL of pregnancy, followed 24 h later with an injection of gonadotropin, either eCG (500 to 1200 IU) or PG600. Inseminations may be based on detected estrus. Further control of ovulation timing is possible by administering hCG (500 to 750 IU) at 72 to 84 h after the gonadotropin treatment. Ovulation is expected 40 to 44 h after hCG and inseminations eight to 16 h before ovulation are most effective. Fig. 2 Protocols to synchronize estrus or ovulation in sheep and goats. eCG = equine chorionic gonadotropin; GnRH = gona dotropin releasing hormone; MGA = melengestrol acetate; PGF2a=prostaglandin F2a; TAI=timed artificial insemination. females during the normal breeding season. Estrus usually occurs within 36 to 48 h after PGF2a Flocks can be syn chronized by administering two injections of PGF2a 11 days apart (see  in Fig. 2). Estrus usually occurs within 36 to 48 h after the second PGF2a injection. Other protocols used in cattle, such as administering GnRH seven days before PGF2a, may have merit in ewes. Hormonal synchronization of estrus in sheep may be accomplished by administration of progestin (feeding oral active progestins, providing intravaginal sponges or inserts containing progestin or progesterone, or ear implants containing norgestomet) plus injections of eCG near or at the end of progestin treatment (see  in Fig. 2). Feeding the orally active progestin melengestrol acetate (0.25 mg per female per day) for 8 10 days produces similar synchrony to ear implants containing norgestomet (3 mg per female) administered for 12 to 14 days. Estrus generally occurs 24 to 56 h after progestin withdrawal.